We've been in celebration mode around the old farm this week. 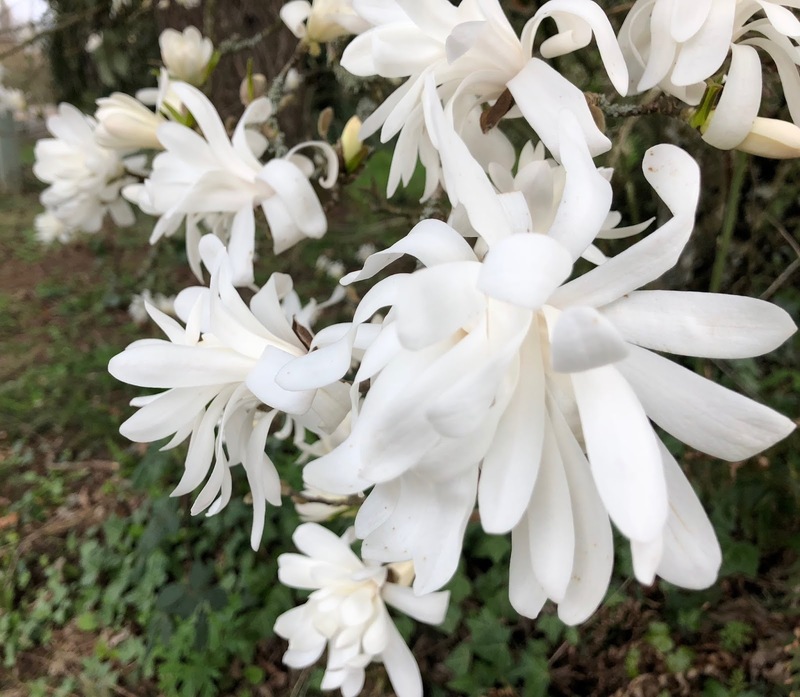 But first off I took my iPhone out for a walkabout in the yard and found that yes, the flowers and bushes and trees made it through the winter and are awakening! First up are the Trilliums in our woods.. Hayden actually took my phone up the hillside and snapped these two photos for me and I think he did very well! 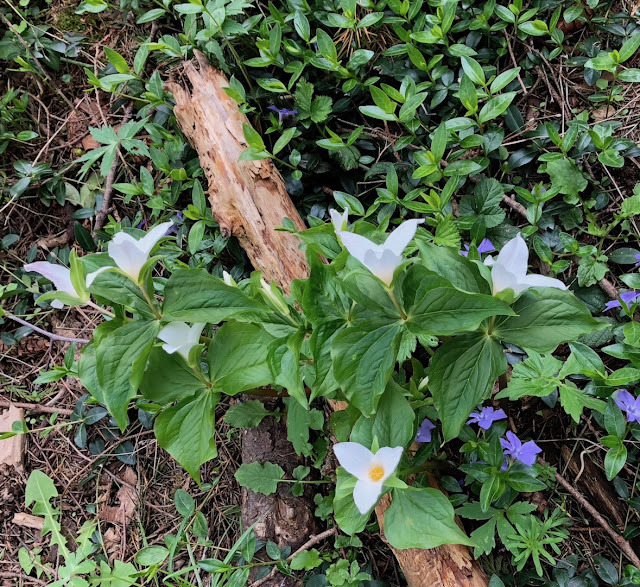 The wonderful flowers grow in little patches on our woodland floor - it's bad luck to pick them as you harm the rhizome and the flower might not come back next year. And look! 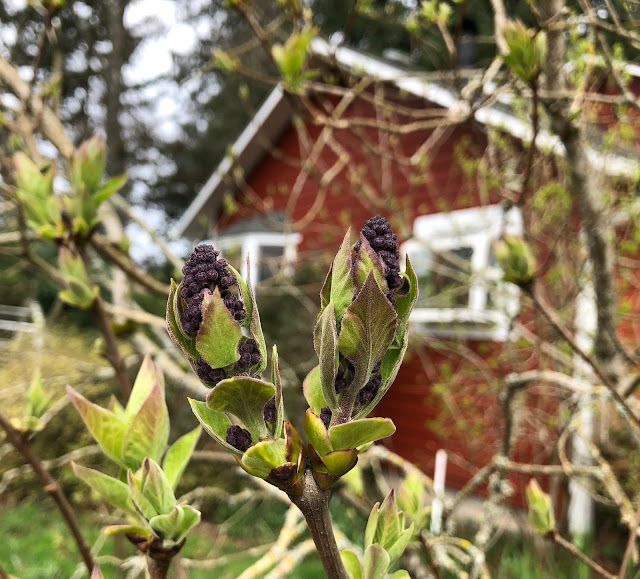 The Lilacs are budded out, it won't be long until I have big fragrant bouquets in the house! This is the dark purple variety. 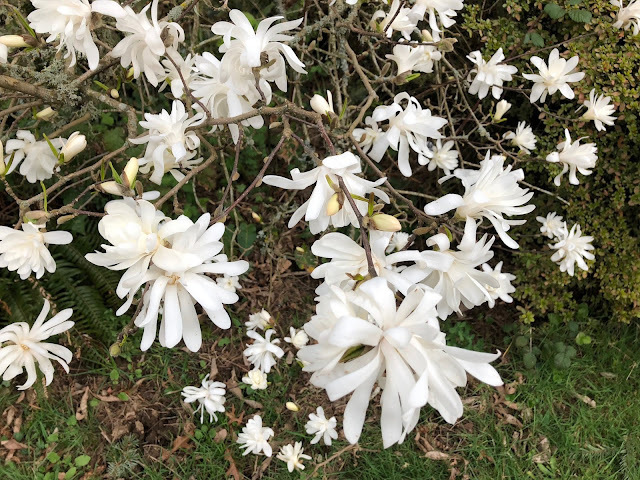 The Star Magnolia is in full bloom and sure does brighten the end of our driveway. I think it's neat how it's just flowers at first, no leaves. The "Oregon Grape" is blooming, not open fully yet but getting near. 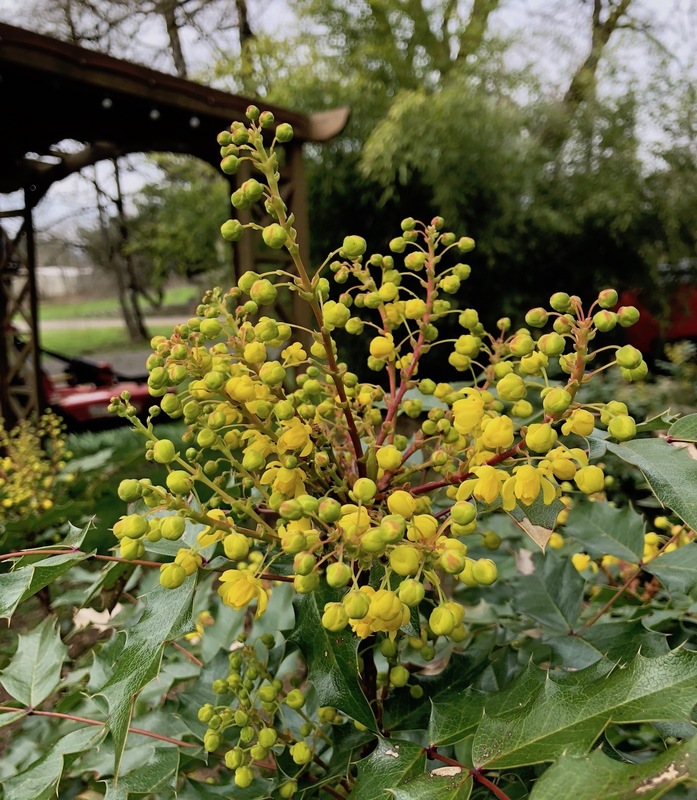 Our state leaders adopted this as our State Flower, then changed it from it's original name of Mahonia. I think that's so funny. 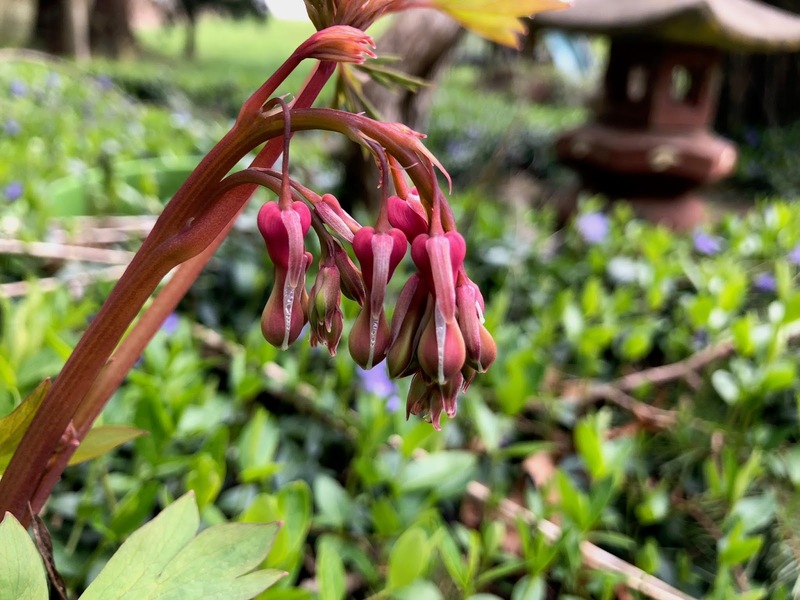 And I've been looking for growth near our pond and lo and behold, the Bleeding Heart is budded out! The Hosta is also poking it's little spikes of growth up out of the ground. On Friday Dayle and I went to the Candy Basket, a chocolate company, and got 2 big solid chocolate Easter bunnies for the boys and 3 little solid chocolate ones for our adult sons and DIL. They had some really BIG solid ones, so Dayle snapped my photo holding one. That's a lot of chocolate! I hope you got some chocolate over the weekend, what kind? 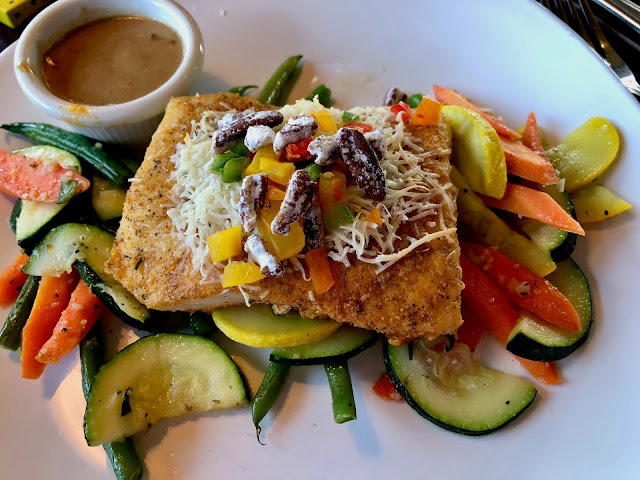 On Saturday we took the boys out for a birthday lunch at Bumpers, this was my meal of Alaskan Pecan Crusted Halibut with a Meunière Butter Sauce. I had them hold the shoestring potatoes usually served with this. I'd never had that sauce but wow, it's delicious! Did I tell you that a few weeks ago that Hayden announced he was a vegetarian? :-) So, he had the pasta with veggies. 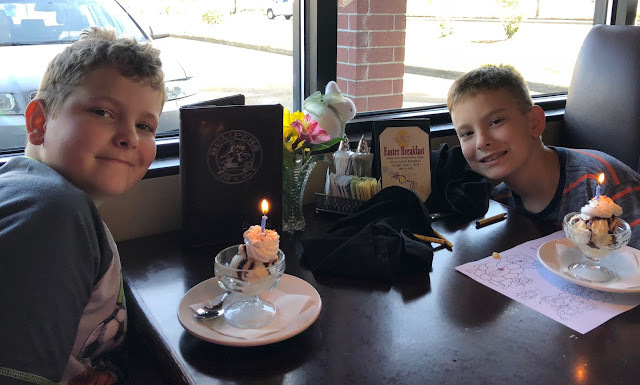 They both were treated to a free birthday sundae. 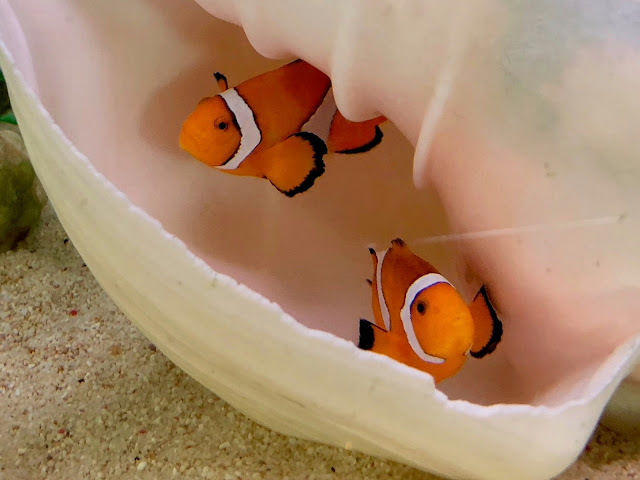 Bumpers has a huge salt water fish aquarium, I took this photo of two little clown fish on my iPhone. 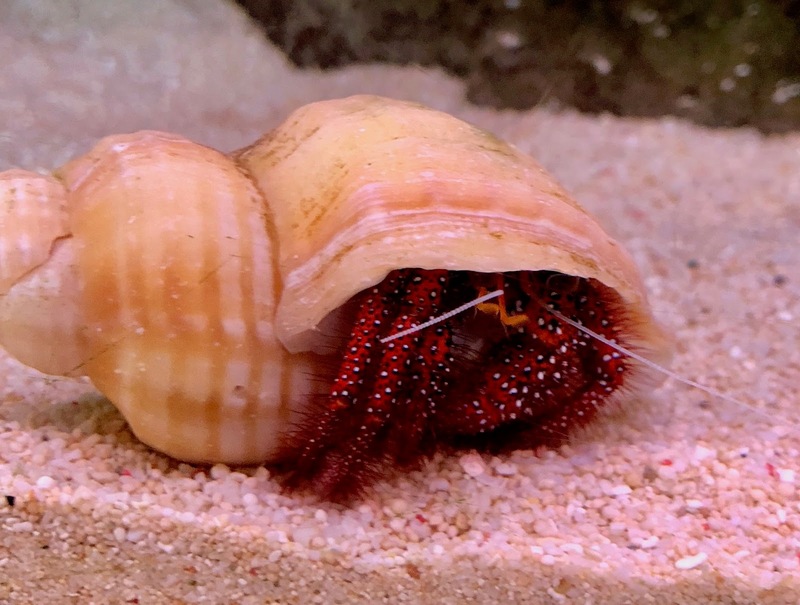 Hayden borrowed my phone to get this shot of a Hermit Crab. Then we took them shopping and let them pick out their own gifts. I wanted to make sure they got what they really wanted, not what I thought they might like. Caleb bought a new jacket and a radio controlled truck and Hayden got some toys that go with a video game he's been playing on his iPad. 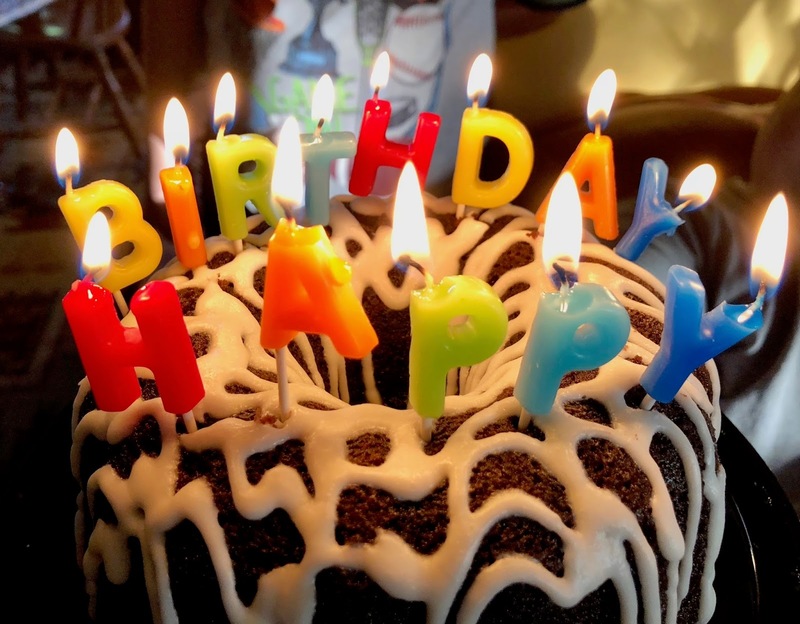 That evening all seven of us gathered in the family room for more gifts, a cake and to sing happy birthday. A great time was had by all. I'd picked up these candles and their cards while the boys were shopping for their gifts. I think this is a pretty festive photo! Then yesterday was Easter. Kristi busied herself in the kitchen all day to make a feast for us all. 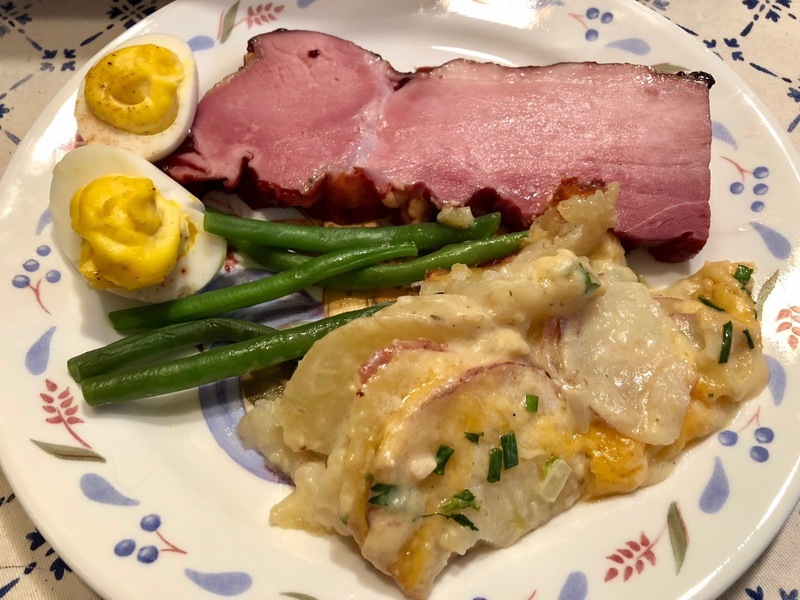 Roasted ham with blackberry sauce, deviled eggs, green beans, scalloped potatoes, homemade rolls and a zucchini cake with cream cheese frosting! I splurged and had the potatoes and they were perfection. 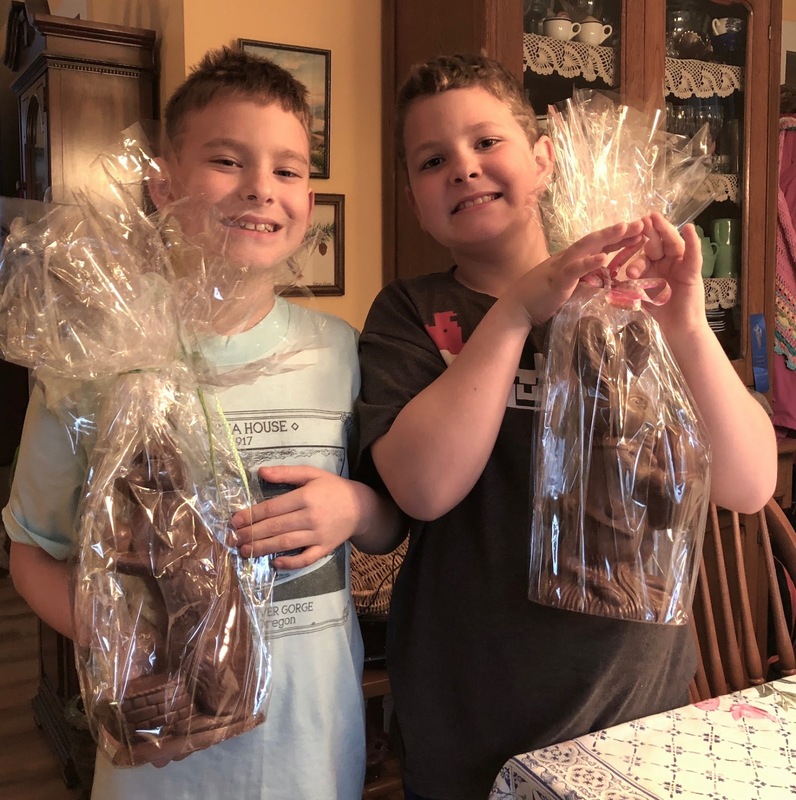 After dinner we gave the boys their cards and their big Easter bunnies. 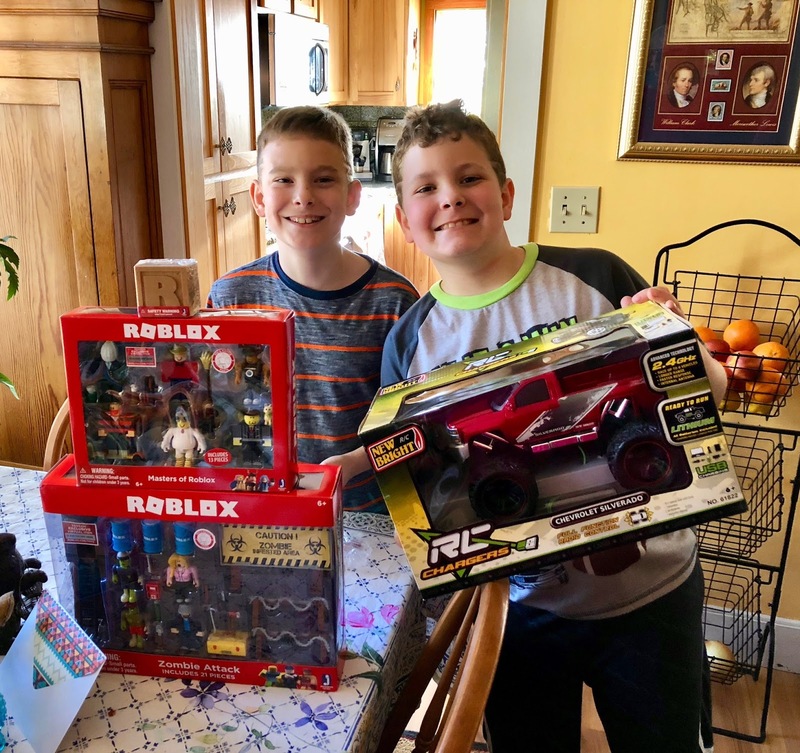 Happy boys! 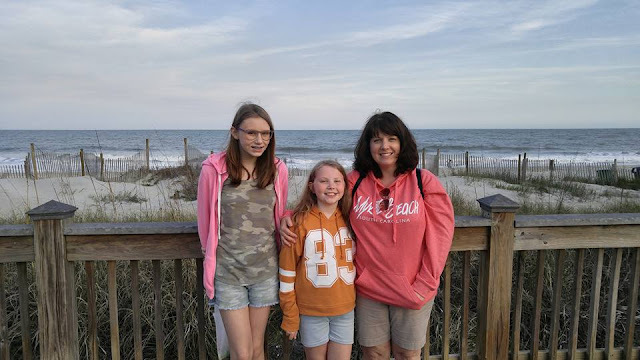 My daughter Amy took her daughters, our beloved granddaughters, to Myrtle Beach, South Carolina, for their Spring Break. They had a wonderful time and I got to see lots of photos on Facebook. I'm glad they had fun. How was your weekend? Do share! Lovely celebrations.We spent yesterday with our daughter,son in law and their two daughters.We had taken lots of gifts,flowers for Sarah,eggs for the girls and a jigsaw to do while they are off school this week,lots of chocolate treats for the adults and some bright primula a for the garden. What fun celebrations! 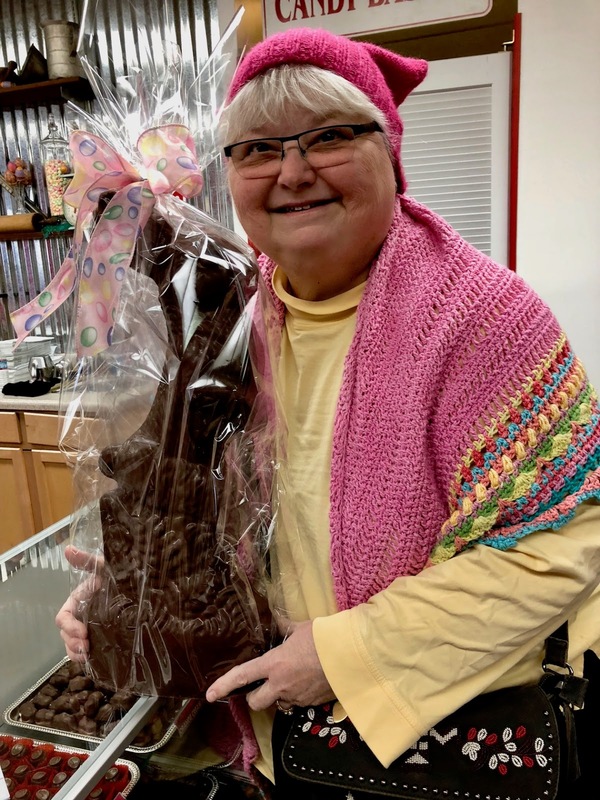 Those chocolate bunnies are HUGE!!! 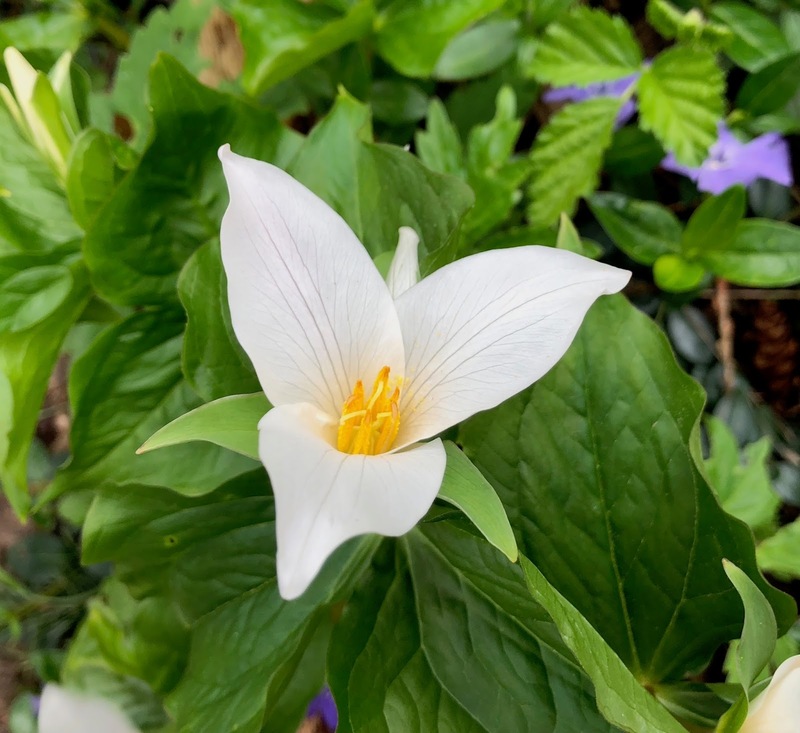 I love Trillium - my Dad always looked for them when out on Spring hikes. 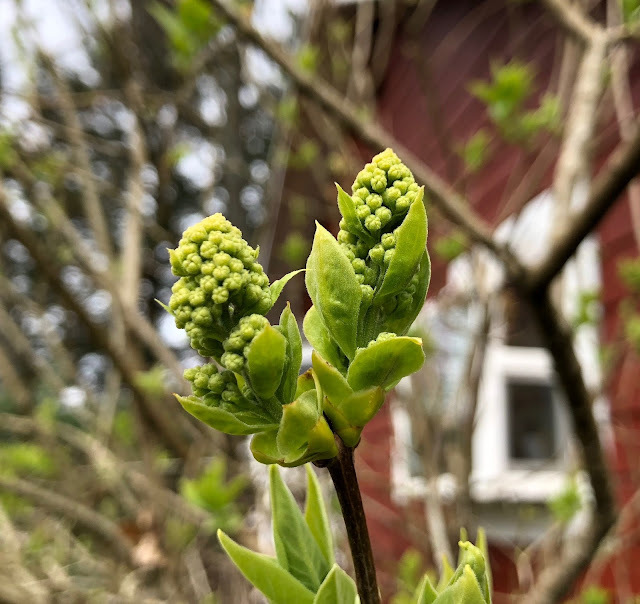 My lilac is just beginning to show signs of budding, but your lilacs are further along. Have a great week Teresa! Happy Anniversary! What a great string of celebrations. You are so lucky to have a DIL that creates such a wonderful feast in your kitchen. :) We had a great day with family...our grandson is too young for chocolate bunnies but maybe next year. I haven't been to the Candy Basket in a long time; always loved wondering over that big chocolate fountain in the lobby. Have a nice week and enjoy your gorgeous flowers! Happy 48th Anniversary! April 1 was my parents anniversary too. It looks like you had a wonderful Easter. The flower photos were beautiful. We had snow this morning but it's all gone now. Winter just won't give up it's ghost here. 48 years is quite a feat! Congrats! Sounds like busy times at your place. The boys are really growing up! Your granddaughters are lovely! Wow - lots of CELEBRATION at your house. Happy Spring. So many celebrations! Looks like you had a full and festive weekend! Happy anniversary! What a lot of lovely celebrations going on in your part of the world. Happy Anniversary! Happy anniversary Teresa and Dayle, also happy birthday to the boys. I bet you're exhausted after all that celebrating. Isn't Kristi a gem - she makes wonderful meals for you. We had a lovely Easter with an egg hunt and sausage sizzle on Sunday then it was my eldest daughter's birthday on Monday. My two daughters went to the zoo and had a 15 minute encounter (lots of petting) with a 4.5 month old Cheetah named Solo. Lots of great pics which I'll probably blog about soon. Dinner on Monday night saw the end of a lovely day. Happy Anniversary, wishing you many more happy years together. Your Easter meal looked delicious you are blessed with a wonderful daughter in law. I was thrilled to be surprised with a visit from our eldest daughter and her little family, we had so much fun together. There is a lot to celebrate but 48 years should be a big part of it. Without you two the rest would not be happening. Those bunnies look delicious. Dollhouse Family and Happy New Year!